Top 5 School Fundraising Problems & Solutions From Original Works! Elementary school fundraisers are an important part of raising money for all sorts of projects, activities, events and charities. Have you had enough of the same old candy, gift wrap, cookie fundraisers? Looking for something fresh, unique and profitable? What Makes An Elementary School Fundraiser Successful? What makes school fundraisers successful? In today’s busy world, parents are working, children are busy with school, sports, and extracurricular activities. Safety is a concern…long gone are the days when children would canvas as many neighborhoods as they could, street by street, carrying a product portfolio or a box of candy bars. Here are some common Problems that schools find when planning and executing fundraisers, along with the solutions that we have found to make those easier! How many times have you heard parents roll their eyes and groan when they hear their kids coming home with packets and instructions on how to sell fundraising items? If they have more than one at a time, going to grandparents, aunts and uncles, and neighbors can be tiresome and nonproductive… People get tired of buying the same old stuff. Especially if it’s not nice stuff. Useful, unique gift items, quality products, many made in the USA. Each one made 100% unique with a child’s artwork. Parents, grandparents, neighbors and friends all appreciate in value thoughtful gift that is personal and distinct. Even the smallest of fundraisers does require some sort of planning ahead. Teachers, parents, and kids are busy…having a fundraiser that requires less time investment from everyone is always a plus. Unfortunately, the planning portion of a fundraiser is often the weak link in the chain of events leading to a successful outcome. Our exclusive Coordinator Guide is designed to help you make your fundraiser a success, no matter who is running it! This handy guide With everything from promoting your program to how to create artwork how to complete without an art teacher, and a complete Customer Service section to make sure you have all the help you need! Problem #3: Lack of manpower. The fact is, there are only so many parents, teachers, staff, and community volunteers available for school fundraising. Parents are working, students are busy with school and sports, and family time is critical for young families. Not everyone can donate the time necessary to make every fundraiser work. Every school district, nonprofit, private school, and community group faces this at some point. There just aren’t enough bodies to make things happen. That’s what we have come up with a number of ways to make our elementary and middle school fundraising programs as streamlined as possible. Our express program is a simple and effective program That combines fundraising with Educational programs. Our Preview Magnet Program allows you to preview A product before you buy. It’s important that everyone involved knows exactly where your fundraiser is at…avoiding confusion, lack of enthusiasm, and missed opportunities. Clear, easy directions and customized tips and tools to make your art fundraising program completion easy and fun! Our program guide gives you the steps necessary to implement your program from start to finish. We provide program promotion tips, even the letter to send home to parents and families letting them know a very special program will be underway at their child’s school soon. This is one of the biggest drawbacks for schools trying to garner enthusiasm and see results for product fundraisers. Everyone – parents, teachers and kids – are tired of dealing with a) too many product fundraisers at once, and b) having their family, friends, relatives and co-workers feel obligated to buy the same old trinket-type products that rarely last beyond the school year. In order to make a fundraiser highly successful, schools need to have products that families want to buy. Our unique, high quality products set us apart from other fundraisers. Original Works gifts are high quality, many of them Made in the USA Certified, and all of them finished and shipped from our Upstate NY location. Each item is highly personalized, featuring a child’s original artwork that is priceless to your most valued customers! Every product is meaningful and useful, and will drive more sales and repeat customers! In the Original Works programs, students create artwork as part of their typical school curriculum. Students and parents then have the opportunity to order quality products featuring their very own artwork! Our Original Program will see your students draw or paint in class (and we can provide lesson plans) so that your school’s teachers can have their charges complete the art in one day. 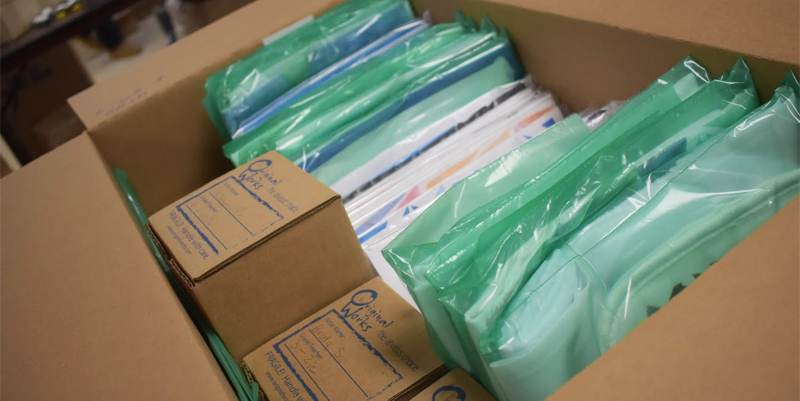 Once the students complete the art, the classroom teacher places their items in what we call the “artwork package” (an order form, the artwork itself, a color brochure, and a letter that’s written toward your fundraising needs describing the program to the students’ parents. This Original Program is completed in about four weeks. The types of items family members may purchase include high quality magnets, calendars, mouse pads, coffee mugs, note cards, ornaments, coaster sets, etc.. If the artwork itself is so popular, the drawing/painting can even be matted for quick framing. Focus on Creativity and Self-esteem. Free Art Paper, Lesson Plans and Supplies. Four Art Programs to choose from. For complete details on all of our programs, please below. We also offer the See Before You Buy (SBYB) program as well as an Online Gallery program. Also consider our Tile & Mural Wall programs.